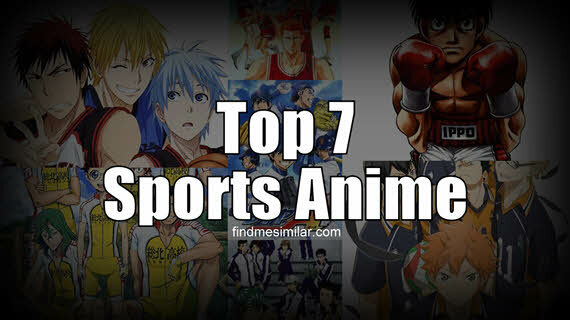 Top 7 Sports Anime '+g+"
If you're a sports enthusiast and an anime fan and cannot wait to watch the top sports anime then we bought you a list of 7 best sports anime for you. Kuroko no Basket is a popular sports anime about basketball. Kuroko is a former member from the legendary Teiko middle school basketball team known as “The Generation of Miracles”. Upon meeting Taiga Kagami, he decides upon becoming his shadow to help him become Japan’s greatest basketball player by defeating the other members of 'The Generation of Miracles'. Haikyuu is an anime about Volleyball which follows the orange haired underdog Shouyou Hinata who finds it hard to find a place in the school team due to his short height. But with his superior jumping power and love to volleyball makes him an asset to his high school volleyball team. Hajime no Ippo an anime about professional boxing. Makunouchi Ippo has been bullied his entire life and one day in the midst of yet another bullying, he is saved by Takamura Mamoru, a boxer. Takamura takes injured Ippo to Kamogawa boxing gym to recover. Amazed by the new surrounding in the gym Ippo wants to learn boxing and thus his journey into boxing begins. Ace of Diamond is a baseball Anime which follows the journey of Eijun Sawamura as a pitcher who must develop his skills as a pitcher in order to reach his goal of becoming the ace of Seidou High school. The Twelve-year-old tennis prodigy, Ryoma Echizen joins the prestigious Seishun Gakuen junior highschool which is one of the top tennis schools in Japan. His goal is to become the regular member of the tennis club. Yowamushi Pedal is an anime about high school competitive cycling which follows Onoda Sakamichi who plans on joining the anime club. He is shocked when he learns that the school has disbanded the anime club due to lack of members and he ends up joining the cycling club after meeting two freshman cyclists. Slam Dunk is an anime about basketball that follows Sakuragi Hanamichi, a junior high punk who joins the Shohoku High School's basketball team because of Haruko, the girl of his dreams and discovers his own hidden talent in basketball.